An exhibition of the wonderful collection of tiaras to be worn by members of the royal family and peeresses at the coronation was opened today. The object of the exhibition is to benefit the Prince Francis of Teck Memorial Fund , for the endowment of Middlesex Hospital. 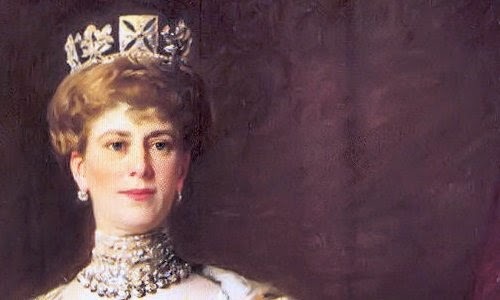 The value of the tiaras is roughly estimated at $1,000,000, but historical and sentimental associations make them priceless. The Duchess of Westminster's crown, with five immense diamonds, was considered by many visitors as the queen of the show . The value of Lady Newborough's crown of diamonds , topped with emerald spikes, is assessed at $90,000. Lady Decies , the most recent American bride, is represented by a crown of diamonds, the wedding gift of her father, George Gould. 1. Detail of Sir William Llewellyn's coronation portrait of Queen Mary; full version here. 2. Prince Francis of Teck was Queen Mary's brother. He died of pneumonia at Balmoral in October 1910, and his will is the one that set the precedent for the sealing of all royal wills to follow. He's perhaps best known to jewel lovers because he bequeathed the Cambridge emeralds to his mistress, Lady Kilmorey, Mary bought them back and had them mounted in her jewels for the Delhi Durbar. 3. In 1911, the Duchess of Westminster was Constance Cornwallis-West (1876-1970), the first wife of the second duke. 4. Grace Wynn, Lady Newborough was the Kentucky-born wife of the 4th Baron Newborough. 5. The newest American buccaneer at court in April 1911 was Helen Vivien Beresford, Lady Decies; she had married the 5th Baron Decies on February 7. 6. Cropped version of an image in the public domain; source here.